user warning: Table 'drupalgastronomer.comments' doesn't exist query: SELECT COUNT(*) FROM comments c WHERE c.nid = 128 AND c.status = 0 in /home/dgabriner/gourmetgastronomer.com/modules/comment/comment.module on line 992.
user warning: Table 'drupalgastronomer.comments' doesn't exist query: SELECT c.cid as cid, c.pid, c.nid, c.subject, c.comment, c.format, c.timestamp, c.name, c.mail, c.homepage, u.uid, u.name AS registered_name, u.signature, u.picture, u.data, c.thread, c.status FROM comments c INNER JOIN users u ON c.uid = u.uid WHERE c.nid = 128 AND c.status = 0 ORDER BY c.thread DESC LIMIT 0, 50 in /home/dgabriner/gourmetgastronomer.com/modules/comment/comment.module on line 992. I should've just stopped by my local taqueria to swipe some salsa for my less than blog-able "south of the border" crab cakes, but I bought tomatillos instead, determined to make my own sauce. I didn't have a vision or even a direction for this salsa and it ended up a little tart and a lot in excess. The meal itself was ok, but forgettable. The only thing that bothered my very core was this salsa failure, this flat ode to the tomatillo. 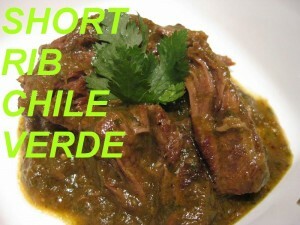 The brewing liquid, salsa verde, is made out of a tart tomatillo, commonly misunderstood as an underripe tomato. That it is not. It comes encased in a husk and is more related to the gooseberry and the schnozberry than it is the actual tomato itself. In salsa, tomatillos are either raw or roasted, for a bit of sweetness. In past experiments I have enjoyed both sweetness and tartness. I used both for the recipe because I am indecisive. 1. Heat the broiler and broil half or all of the tomatillos 4-5 inches away from the flame for 4-5 minutes on each side. Broiling matures the tart into tangy. If you want to sweeten up the dish, roast all. The tomatillos should be slightly browned, olivey and soft. Cool them afterwards. 2. While the tomatillos are broiling, chop the onions, garlic, peppers, green onions and set aside. 3. Finally, for the meat. Rinse, dry with a paper towel and salt & pepper on each side. I admit to using boneless short ribs, because I was in a penny pinching mood, but go for bone-in short ribs, please! 4. Pour flour onto a plate and quickly dredge (coat) the meat on all sides, shaking off excess flour. 5. In a 3-4 quart pot, heat oil on high. Place the meat in the pot and let it sizzle away. If all the pieces do not fit in one layer, do two rounds. 6. Once the meat is browned, remove it from the pot, and add your veges. Saute with a little added oil and salt if needed, med-high, 3-5 minutes. 7. Transfer your veges to a blender. Add cilantro and tomatillos, roasted or not, and blend until smooth. If you prefer a little chunk, blend less. If you see too much skin, strain. Transfer back to the pot, along with the chicken broth and the bay leaf. 8. Add in meat. Bring to a boil, reduce to a simmer, cover, and cook for 3 hours. You will get something that looks a bit like this. Enjoy! Remember, save some fore tomorrow!